Reverse Tension Guitars incorporates an innovation covered by several US and international patents and is the only company licensed to use the Reverse Tension system. The Reverse Tension configuration pulls backward on the bridge relieving much of the pressure caused by the playing strings. 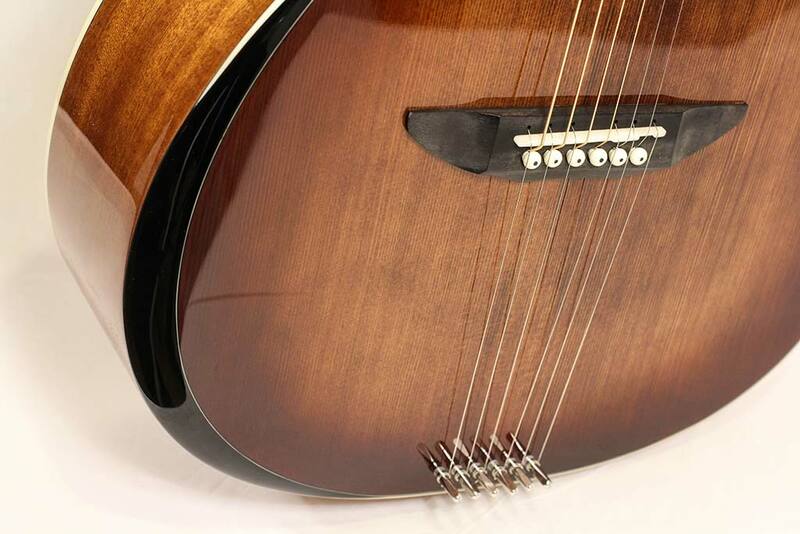 By relieving the bridge, the amount of bracing normally required on the underside of the guitar top, or soundboard, can be dramatically reduced compared to the heavy bracing needed on all other acoustic guitars. Less structure means more vibration, greatly enhancing volume, balance, clarity, sustain, overtones/harmonics, and all-around greater richness of tone. All this is accomplished while adding stability to the instrument and eliminating several possible warranty issues as the bridge and top are completely stable. (We have noticed that many production guitars are significantly over-braced. This serves only the manufacturer by way of reducing the likelihood warranty claims.) The Reverse Tension system has been used to retrofit existing guitars to great effect. (Retrofitting uses a different Reverse Tension string anchoring method than is used in RT Guitars.) It has even been used to fix guitars that have become unplayable due to high action from tops pulling up. The Reverse Tension system can take any guitar and make it better. It turns good guitars into great ones. It puts “magic” into guitars at a much lower price point than has ever been possible before. There are many subtleties to the use of this system in order to get the most out of it. The Luthiers at RT Guitars have gained a wealth of knowledge about tweaking bracing and other esoteric adjustments to acoustic guitars through many years of experimentation modifying instruments and building custom guitars. We have even done away with the classic X-brace. We use several proprietary, super-light bracing patterns that do not use it. This would not be possible without the Reverse Tension system. It changes everything. The Reverse Tension system is actually very simple. The fact that no one has done this before or patented the idea is actually surprising. But now it has been done. Many players have already been amazed by the results. If you have the opportunity to play one of these instruments, we sincerely believe you will agree with us that this is the future of the acoustic guitar. You may be saying, “Yeah, I’ve seen that on an archtop” or maybe on a very old Gibson. While the Reverse Tension strings going to the tail of the guitar may look familiar, you actually have not ever seen this before. On those other guitars the playing strings extend over the saddle and continue to a tailpiece that holds the strings in place. This is really not a friend of tone. Much of the energy in the vibrating strings is not forced into the top and continues traveling to the tailpiece adding no tonal value to the instrument. 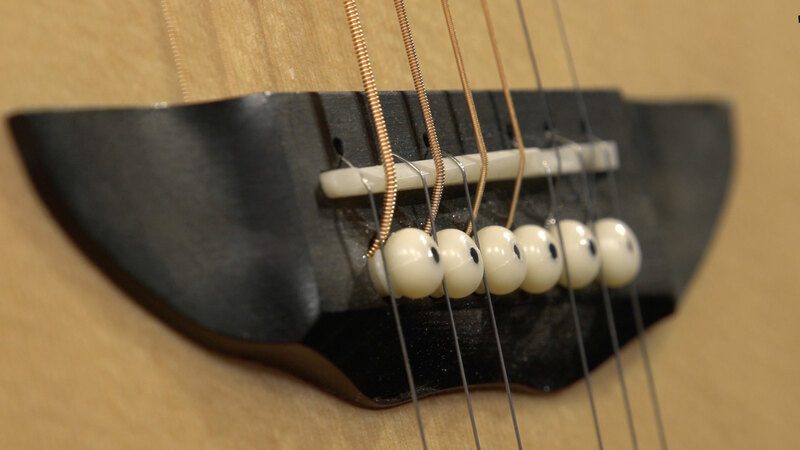 Our playing strings terminate right behind the saddle, just like most other acoustic guitars. You can use any standard guitar strings you prefer. The separate Reverse Tension strings start in front of and continue over the saddle to the tail. These strings generally do not require replacement or any other attention once set by the factory. Tightening our Reverse Tension tail strings to relieve the pressure of the playing strings frees the top and also applies more down pressure on the saddle. The string energy is forced into the top more efficiently. More string energy and less bracing = Volume, Sustain, Balance and Tone. There are several potential warranty issues solved by the Reverse Tension system as the top of the instrument has been stabilized and cannot pull up nor can the bridge pull off the instrument as has happened to many guitars from the past after years of the 170 to 200 pounds of forward pull from the playing strings.